All over the world, back pain is the number one cause of disability, lost time from work, and the third most customary reason for doctor visits. Back pain is caused by strained muscles, torn ligaments, degenerating disks, and inflamed joints. There are a number of treatments for this pain. Chemical medications are the first things for which people ask their doctors, side effects notwithstanding. Pain pills and anti-inflammatories are the first treatment given by doctors, along with a referral to the physical therapist. When the pills are gone, though, and the pain persists, then sufferers begin looking for something more effective. Chiropractors are medical professionals who work with the bones. They adjust the bones so that the muscles and ligaments around them return to their original function. It’s difficult to handle pain when a strained back muscle makes movement, sudden or otherwise, unbearable. Surgery is the very last resort for most people. Doctors would rather see you on a treatment regimen that includes physical therapy. However, today’s medical professionals are reaching for outside-the-box treatments for back pain such as natural remedies and essential oils. Essential oils are used by holistic doctors and healers and are becoming more mainstream by the day. Online can be found many studies about the oils from such authorities as the National Institutes of Health, the Mayo Clinic, and the Centers for Disease Control. Which essential oils ease back pain? CERTIFIED ORGANIC ROSEHIP OIL by USDA - the strict oversight of USDA ensures the integrity of our Organic Cold Pressed Rosehip Seed Oil. In other words, it’s really 100% ORGANIC. Flaxseed "Virgin" Oil is cold pressed from seeds of the Flax plant. It is an emollient, high in essential fatty acids, vitamin E , vitamin B and minerals. It contains the alpha-linoleic acids (ALAs) which may contribute to younger looking skin. Bergamot acts as an analgesic which is the same thing as aspirin. It soothes the painful area at the same time its other properties are canceling out the pain. Bergamot can be used on bare skin, but if you need to cover a large area, mix it with a carrier oil. If you’re using it on bare skin, drop three drops onto the painful area and rub in. If you’re covering a large area, mix the three drops with a teaspoon of carrier oil like jojoba, almond, or grapeseed oil and massage into the painful area. If you’ve ever used a pain relieving cream, chances are good that it smelled minty. It contained wintergreen and probably peppermint, because they both classify as “counterirritants.” When wintergreen is rubbed into the skin, it numbs the area much like cortisone. Wintergreen also has analgesic properties which means it acts like aspirin in soothing the painful area. It is also anti-inflammatory, aids in blood circulation, and soothes irritation. Combine these with the numbing property of wintergreen, and you have a significantly less painful area. Drop three to four drops on the skin if you’re using wintergreen alone. If you’re mixing it with peppermint, then mix two drops of wintergreen and two drops of peppermint and massage into the painful area two to three times per day. Copaiba essential oil is extracted from the resin of the South American copaiba tree. The scent is sweet and woodsy and can be detected in perfumes and soaps. Copaiba has so many health benefits, that it’s difficult to narrow it down to one, but we did it. This essential oil is taken internally, so make sure the oil you choose is food grade and not therapeutic grade. Drop one or two drops into a smoothie, tea, or water and drink it down three times per day. Eucalyptus essential oil comes from a tree found only in Australia and its surrounding islands. Eucalyptus with its analgesic properties is usually found in pain relieving creams and vapor rub. However, its health benefits don’t stop there. Eucalyptus’ anti-inflammatory properties decrease muscle pain when it’s rubbed into the painful area. Eucalyptus can be inhaled as well. Mix two to three drops of eucalyptus essential oil in a carrier oil such as grapeseed or jojoba. Massage into the painful area two to three times per day. If you’re inhaling it, drop two to three drops into a diffuser. This essential oil comes from the Bulgarian juniper berries and needles. They’re really not even berries but the female seeds that are the basis of the tree. Long known as antioxidants fighting free radicals, juniper is also known as a sedative and anti-spasmodic. This works on inflammation, easing back pain. Add five to ten drops of juniper essential oil to warm bathwater and soak for 20 to 30 minutes. Rose hip oil is not an essential oil. It’s made from the seeds of the left over fruit when a rose has flowered and lost all its petals. Rose essential oil is made from the petals of the flower. This essential oil is safe enough to use on bare skin just like coconut or olive oils. A great anti-aging essential oil, rosehip oil is a great anti-inflammatory agent. When used as a dry powder, rosehips prevents the manufacturing of inflammatory enzymes and proteins. When used as an oil, you can drop ten drops into warm bathwater and have a good soak. A tea can be made from rosehips as well. Flax has been used since the beginning of recorded history. The whole plant was used in the making of thread which was spun into cloth. Today, flax is used in bed linens, underwear, and linen clothing. Linseed oil also comes from the flax plant and is used in cooking and woodworking. For our purposes, flaxseed oil is known for its Omega-3 and -6 properties which is good for heart health. Omega-3 fatty acids are also anti-inflammatory which is good for easing back pain. Flaxseed essential oil can be used instead of a cooking oil like olive oil. It can be used in yogurt and cottage cheese. It makes a great oil to use on salads. It can also be used instead of butter on potatoes, rice, and bread. Use flaxseed oil on foods after they’ve been warmed, or it will oxidize and lose all its nutritional value. This essential oil is extracted from the roots of a mature sandalwood tree. India is known for its high quality sandalwood essential oil. Alpha- and beta-santalol are the two molecules making up sandalwood’s properties. Alpha-santalol is the molecule that holds the anti-inflammatory property we need for back pain treatment. Mix three to four drops of sandalwood essential oil with one teaspoon of a carrier oil like almond or grapeseed oil. Massage into painful area two to three times per day. Drop 10 to 15 drops into a warm bath along with epsom salts and soak for around 30 minutes to relieve back pain. Clary sage essential oil is extracted from the European-grown clary sage herb. Its seeds are used in making muscatel wine, and its essential oil is used in soap, shampoo, and perfumes such as Eau de Cologne. Its properties include among others anti-spasmodic and anti-inflammatory agents. It’s also a nerve tonic and sedative. To benefit from this pain relieving oil, drop 10 to 15 drops in warm bath water and soak yourself. Mix three to four drops in one teaspoon of a carrier oil such as extra virgin olive oil or almond oil. Massage into the painful area two to three times per day. Cooks know the chopped leaves and stems of the basil plant as the herb they use for flavoring dishes. Its essential oil, however, is extracted from the flowers of the plant. The essential oil is used in everything from mouthwash to food to perfumes to insect repellent. Basil essential oil is anti-inflammatory which aids in pain relief. To relax muscles, mix four to five drops with a carrier oil such as grapeseed oil or almond oil. Massage into the painful area two to three times per day. You can also drop 10 to 15 drops in a warm bath with epsom salts and soak the pain away. Lavender is mild enough to rub right into the skin in the painful area two to three times per day. It can be added to a warm bath in which to soak. Tea tree essential oil or melaleuca is extracted from an Australian plant and used for dozens of things. 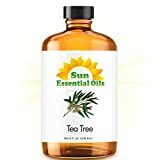 Tea tree oil is found in topical pain relievers, household cleaning products, perfumes, soaps, and skin creams. Over 100 chemical properties give tea tree oil its power, one of which is anti-inflammatory. Drop 10 to 15 drops in a warm bath with epsom salts and soak away back pain. Mix one drop with one teaspoon of a carrier oil like olive or coconut oil. Massage into the painful area two to three times per day. Do not take tea tree essential oil internally, because it’s poisonous when ingested. Lots of people are still unaware that essential oils exist, that they’re safe to use, or even that they are a viable alternative to chemical pain medications. There are literally millions of pages on the Internet and books in the library detailing the properties of essential oils, their uses, and how to mix them.